The GDMS program carries out an automatic backup each evening. 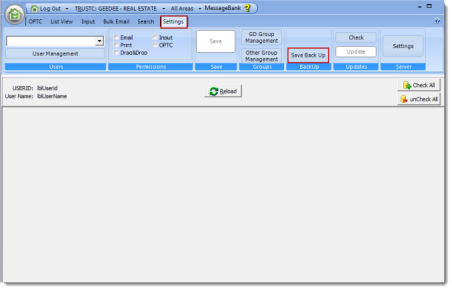 GDMS uses a "live" backup system and there is no need for users to exit the program while the backup is being performed. A snapshot is taken of the data during the day and then converted into a compressed file. It is strongly recommended that users regularly copy the current data files to a piece of removable media eg: USB device, CD/DVD, remote offsite backup location etc. that can be taken "Off-site" for safe keeping. Where are my GDMS data files that I am required to back up for security? The GDMS data files can be automatically copied to the folder Backup Location of - G:\Program Files\GeeDee\ArcServer\SvrBackup\. This is the folder that you need to be sure is being backed up as well as the G:\Program Files\GeeDee\ArcServer\DB\ folder. Most Servers today a backup up automatically by your IT people through out the day. If you have implemented a imaging backup process like Shadow Protect with your IT person, your data is already covered. This is NOT a hard-coded location and CAN be altered to a different location of your choice. You or your I.T. person can easily change. Remember, it never hurts to confirm and ask if your IT person has this covered for you. Do not forget to regularly check that your backups are occurring and advise your I.T. person to include this folder in their backups for your business. Please advise your I.T. 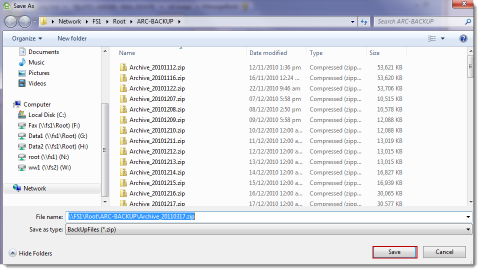 expert of the "G:\Program Files\GeeDee\ArcServer\DB\" folder location for manual offsite backup! Most clients who have a Windows Small Business Server will already have a scheduled and automatic backup already in place. Please confirm. Have you ever lost data on your computer? It can be very frustrating. In business it can be time consuming and expensive. What would be the consequences of losing all of the financial records of your business? Problems with power (including lightning strikes and low voltages) account for a large number of computer failures. Another culprit is computer viruses, and just plain hardware failure. Don’t put backups off, data loss CAN and probably will happen to you sometime. The simplest and cheapest backups involve copying your data over to CDs or DVDs. Another option is USB flash drives or USB external hard disks. Don’t forget to keep a copy off site – if there was a fire in your office, your backups and computers would probably be both ruined. Another option is online backup. Companies such as http://www.SugarSync.com/, https://www.cubby.com/ (free) and http://www.dropbox.com/ (free) will back up your data over the internet for a small fee (approx USD$50 to $90 per year). How often do I need to backup my company data files? Ideally, your company data files should be backed up after each days use. 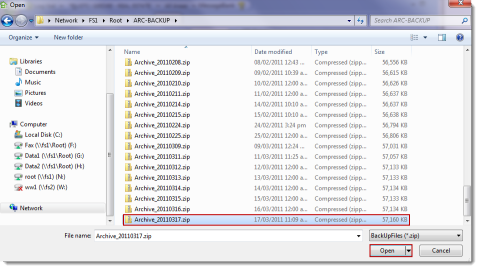 Should something happen to your company files, you will be able to restore the backup of the last session. While you’re doing those backups, don’t forget to give a thought to the shelf life of your media. Floppy Disks can start to degrade after a year or two – more than 50% are unreadable after 5 years. Writable CDs and DVDs don’t last as long as your movie DVDs – they aren’t constructed the same way. Some reports indicate that five to ten years is a reasonable life expectancy for CDs and DVDs, but heat, dust and other environmental factors may shorten this time. USB flash drives and hard disks are magnetic storage media and will lose some of their magnetic imprint over time. Also they can be quite easy to damage. Dropping a hard disk can cause it to fail completely, where as I’ve seen several physically broken USB flash drives. What’s the answer? Keep multiple copies of your data on different types of storage media and in different locations. Please advise your I.T. expert of the above folder location for additional manual offsite backup! To locate the GDMS backup files it is necessary to be logged on to the system as "Administrator". From the "Settings" drop down menu, click on the "Save Back Up" button. An "explorer" style window will open showing the location of the GDMS backup files (this is set in the ARCHIVE server and should only be done by the Administrator - If the correct location is not displayed then you should locate the directory on your network). Select the file you wish to copy and then click "Open". You will then be prompted to select the location where you want to copy the chosen file. Simply select the location and then click "Save" and the file will be copied to the selected location.